As Christians we suffer reproach for believing in God, but it is an honor to be an example so others may see Christ in us and by hearing the message of the gospel and accepting it they will be saved. 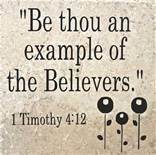 (1 Timothy 4:10-16). For therefore we both labour and suffer reproach, because we trust in the living God, who is the Saviour of all men, specially of those that believe.These things command and teach. Let no man despise thy youth; but be thou an example of the believers, in word, in conversation, in charity, in spirit, in faith, in purity. Till I come, give attendance to reading, to exhortation, to doctrine. Neglect not the gift that is in thee, which was given thee by prophecy, with the laying on of the hands of the presbytery. Meditate upon these things; give thyself wholly to them; that thy profiting may appear to all. Take heed unto thyself, and unto the doctrine; continue in them: for in doing this thou shalt both save thyself, and them that hear thee. Throughout the bible we find many examples of our brethren which have gone before us that through faith moved mountains and came out on the other side of bad situations only to see the glory of God in it! Have compassion and make a difference in this life, while remembering it is as pulling some out of a fire if they be set on living in the flesh (world) than in the Spirit. (Jude 21-25). Keep yourselves in the love of God, looking for the mercy of our Lord Jesus Christ unto eternal life. And of some have compassion, making a difference: And others save with fear, pulling them out of the fire; hating even the garment spotted by the flesh. Now unto him that is able to keep you from falling, and to present you faultless before the presence of his glory with exceeding joy, To the only wise God our Saviour, be glory and majesty, dominion and power, both now and ever. Amen.